Sent-away sons is a prominent theme in Genesis. It begins with Cain being sent away by God and it ends with Joseph being sent away by his brothers. Cain was banished for killing his brother Abel and Joseph was sent into captivity by Reuben, Jacob’s firstborn, to avoid his brothers killing him. Patterns such as this are what make the Genesis material rich with meaning. The pattern continues in Exodus where Moses leaves Egypt after killing a fellow Egyptian. Like Cain, he must leave his home. He travels to his Midianite kin and marries a patrilineal cousin, Zipporah. This suggests that Jochebed, Amram's cousin wife, was a Midianite bride. The Midianites were descendants of Abraham by his cousin wife Keturah. 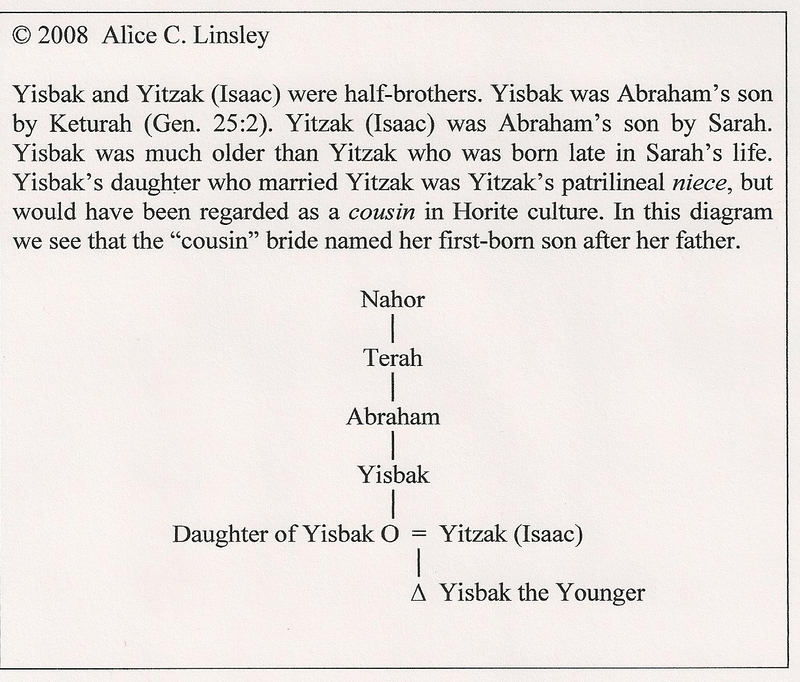 Other sent-away sons include Ishmael and Yishbak, both sons of Abraham. The name Yishbak means “sent away.” In Genesis 25:6 we are told that before he died, Abraham "made grants" to his other sons and then sent them away from his son Isaac. If this is meant to include all of Abraham’s sons, it pertains to Ishmael (son of the Egyptian concubine Hagar), Yishbak, Joktan, Midian, Shuah, Zimram, Medan (sons of the Afro-Arabian wife Keturah) and Eliezar (son of the Aramaen/Syrian concubine Masek). The descendants of Joktan settled in Southern Arabia and are known to this day as the "Joktanite Tribes." They are Muslims, having rejected the Horite faith of their father Abraham who expected the Son of God to come in the flesh in fulfillment of the Edenic Promise. Of all the sent-away sons Jacob's case is the most informative. He supplies the clues as to how this sending away worked. He was sent to his mother’s people and there he married two wives and eventually became a great man. This pattern appears to be the norm for sent-away sons. 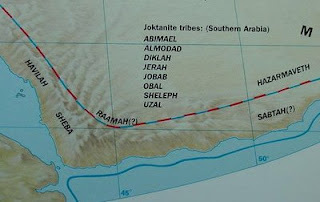 Ishmael went to where his mother’s people dwelt “toward Egypt” and married an Egyptian wife of his mother’s people. 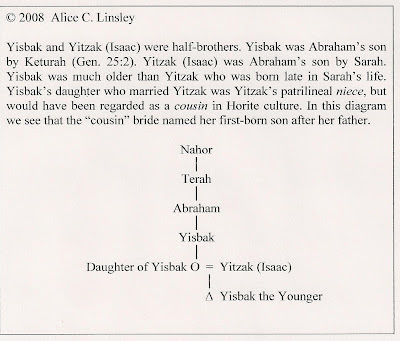 We aren’t told where Yishbak went, but his daughter married Isaac and named their first-born son Yishbak after her father. This cousin bride’s naming prerogative is characteristic of Abraham’s Horite people. Cain, like Yishbak, Jacob and Moses, probably married a cousin bride from his mother’s people. If so, Cain’s firstborn son Enoch was named after his bride’s father. This Enoch the Elder was also the father-in-law of Seth, Cain’s brother. Enoch would be a contemporary of Adam were Adam an historical figure rather than the archetype of the first created human (which is what he represents throughout the Bible). While we aren’t told what happened to all of Abraham’s sent-away sons, we have enough information to determine that they did well for themselves among their mother’s people. Abraham was himself a sent-away son, according to the biblical evidence. His father had 3 sons: Haran, Na-Hor and Abraham. Haran and Na-Hor were the firstborn sons and heirs. Haran would have ascended to the throne of his maternal grandfather had he lived. Na-Hor ascended to the throne of this father Terah. The only circumstance in which Abraham was likely to ascend to Terah’s throne was if Na-Hor, his older brother, died. Haran had died in Ur, which meant that Na-Hor was heir to Terah’s kingdom between Ur and Haran. It was at this point that God assured Abraham that he too would have a kingdom if he trusted God and went to his mother’s people in Horite territory. Likewise, Jacob was sent to his mother’s people and he too was eventually established as a great nation. Joseph married Asenath, a Horite bride, which means that Joseph married a bride of his mother’s people. Rachel’s confiscation of the idols of Terah (teraphim) insured that Jacob would be recognized among Terah’s Horite people who originated in Egypt. Jacob and his wives were aware that Laban didn't plan to honor any agreements that might strengthen Jacob's position as a ruler. Laban had other sons and they were jealous of Jacob's successes. These sons were saying, "Jacob has taken everything that belonging to our father; it is at our father's expense that he has acquired all this wealth." (31:1, NJB) Rachel and Leah's brothers were watching for the right moment to deal with Jacob, for Jacob had to make plans with his wives out in the fields where he kept his flocks (31:4). That way they wouldn't be overheard. The plan involved leaving Paddan-Aram while Laban was away shearing sheep. Laban formed a war party with his brothers and went after Jacob. When he located him, Laban pitched his tents on Mount Gilead from which he has a view of Jacob's tents on the hills below. Laban was extremely angry because he felt that Jacob had stolen his daughters and the ancestor figurines which he had inherited from Terah, called Teraphim. His thoughts were murderous, but the Lord cautioned Laban in a dream not to cause trouble with Jacob (31:24). For all his faults, Laban apparently feared God enough to seek a non-violent resolution. According to Hurrian records, family shrine figurines were passed to the son who would be heir to the father's territory. Laban intended that the Teraphim would go to one of his first-born sons. Jacob would never rule over Laban's territory, but there was still the threat of Leah's first-born who was named for the great Afro-Asiatic ruler Reu, son of Peleg in whose time the tribes became geographically separated. At some point after Peleg, the Arameans became jealous of their control in the north while their brother Horites controlled the southern territories. The time of division began about 5 generations before Abraham, and involved a geographical separation, but not a change in the marriage pattern of these ruling houses. By taking the ancestor figurines, Rachel hoped to gain legal leverage for her first-born son in the southern territories. Rachel's first-born son was Joseph. Might this have given Joseph's brothers greater motivation to get rid of him? This explains why Jacob named Rachel's second son Ben-Jamin, which means "son of the south." It was in Judah among Jacob’s mother’s people, that the promise of Genesis 3:15 would be fulfilled. He who was born of “the Woman” would come forth from Judah. He would crush the serpent’s head and restore Paradise. He was a sent-away from His Father in Heaven in order that He might receive an eternal kingdom. All of Genesis is really about one thing: Jesus Christ, the Son of God, who came into the world to save sinners, like me. Maybe you've addressed this and I've not seen your response. The Horites seem to have spread the Edenic promise to other areas of the world, as you've noted in other posts. Why was the Edenic promise preserved in a fashion among Horites and not among other religious groups? The most obvious answer to that is also the most likely. The Edenic Promise was first given to Abraham's ancestors and they believed the promise, just as Christians today believe that Jesus is the Son of God who rose from the dead and gives eternal life to those who trust in Him. 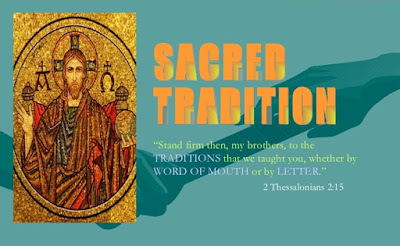 These articles at Biblical Anthropology reveal that the Creator was preparing the people over many millennium for the Christ who would fulfill the Edenic Promise of Genesis 3:15.